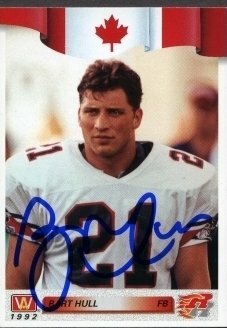 After an excellent career as a running back at Boise State, Bart Hull was a first round draft pick (fourth overall) by BC in the 1991 CFL college draft. Hull was traded to Ottawa before the 1991 season started, however, for QB Tony Kimbrough. Hull played 3 games with Ottawa in 1991, but was released in 1992. He was on the Winnipeg Blue Bomber practice roster in 1992 before being released. Saskatchewan signed Hull in March of 1994, and he was released in October after playng just two games. By the way, if you are wondering about that last name, Bart Hull is indeed a brother of Brett Hull and son of Bobby Hull - both now in the Hockey HOF.